The unexpected tragedy. The unforeseen diagnosis. The unwanted trial. The marital betrayal. The dysfunctional family. The chronic awareness that things are just plain hard. Whether we hide or not, suffering finds each of us out. And no matter how we respond initially – shock or anger or peace or unbelief – what inevitably follows is either too much to feel or void of feeling at all. all images by Lauren Kuykendall; her eye for beauty is a gift. see more of her work here. Most of us don't know what to do with our grief. We don't really even prefer to call it grief. The trial we’ve been dealt doesn’t seem worthy of the title. Or if it does, to name our numbness, our outbursts of anger, our lack of holding it together grief, we'd be forced to reckon with the pain that's festering like an old wound in our souls. We'd almost rather let it haunt us than to stare it in the face because if we're honest, we know we're not strong enough to stand up to it. And most of us sitting across the table fumble over not-good-enough words, if we say any at all. Yet more than ever, we sense how needed the words are. The pain they’ve unlocked calls for a response, and in our search for the right words to say, silence typically becomes our greatest friend, even while it declares our inadequacy. We want to carry our friend's burden, and sometimes we do with prayer or a meal or a phone call. But sometimes, we prefer to leave the load where we found it. Burdens get heavy, and pain has this intrusive way of creeping in and tainting everything good. Grief can feel sticky and indefinable, neither of which are preferable. We're naturally averse to grief; it's not the way things were supposed to be. Sadness and sorrow and disease and death. It's not the way things were supposed to be. There's no quick fix, no shortcut, no concise answer, but there's hope. In God’s mysterious wisdom, the road of grief is marked with new sensitivity, new awareness that life has to be about something bigger. Grief aches for life to matter, for pain to matter. Grief makes us cry out. We need rebuilding. We grow desperate for resolution. For hard questions to be answered, for tears to be wiped away, for rescue from this weary existence in a fallen world. Grief breaks, tears down, devastates. The Word of God repairs, rebuilds, raises up. Over time, little by little, day after day. Thus, we walk because we must. Though we'd rather stop and make it all stop and rewind and go back, we take heart and let the Word take hold of our heart. The Word that lights up our paths, the Word that lets us get intimately acquainted with Him who is our Light, though darkness surround us and hem us in. Because our sorrow welcomes our Messiah who welcomed His banner for our sake, Man of Sorrows. By His wounds you have been healed. For you were straying like sheep, but have now returned to the Shepherd and Overseer of your souls. This is where we must go, and this is where we must lead our friends – to the Shepherd and Overseer of our souls. To the Lamb of God who pierced death with His own. To His Word that unveils the kindness of our God who never wanted pain to be. To His Word that declares the curse is lifted and one day, this pain will end. And we must hold on to this Word for dear life. Emily and I don't offer these words and this product lightly. We created these Grief and Sorrow Verse Cards firstly, because we needed them. This place of ministry beckons our hearts and our hands. 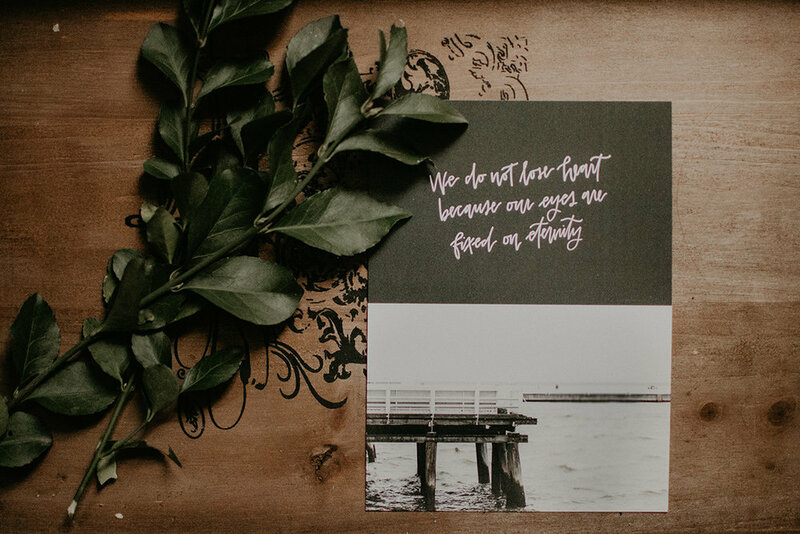 These verse cards were birthed out of the needs presented – the ache to stabilize and strengthen in the insecurity of grief and to fill in the silence when our hearts want to speak life to a friend but our lips draw a blank. If you do any sort of creative work, you know that it’s nearly impossible to create anything of value that doesn’t first come from the inner stitching of your own heart. We create from the glimpse of God we’ve seen, the glimpse of God we’ve needed to see in light of the lot He’s ordained for us. We’ve reckoned with that hazy grief, and we’ve counseled women through sorrow too much to bear on their own. These are the verses that have come alive on the road of sorrow, that have brought our God near to us on our walks. We pray they’ll do the same for you, too. “Suffering is so deep and intimate; it needn’t be exposed before everyone. I wanted beautiful images and key phrases to draw out the unspoken words within. Tender messages that would call Scripture to memory and call me to come and receive life. This is maybe the hardest and most painful project I’ve ever done. When I started, I worked as an outsider, thinking that grief and sorrow were far from me. But the deeper into design I walked, the more God unveiled my own portion of pain. Hours of design were spent wrestling, through tears, over whether I would believe or not. I couldn't simply create layout; I had to read the words before me. I had to meditate on them. I had to let these words get inside of me, nearer than the sorrow that clings so closely." I told Emily that it’s evident in the end product that she worshiped all the way through them. We'd love for you to gift a set of these Verse Cards to a hurting friend, and we'd love for you to have a set of your own.